At 8:30 p.m. last Monday, a ‘Timely Warning’ email delivered via the UMass Lowell Emergency Notification System unnerved the student body with reports of a brutal stabbing that had occurred over an hour earlier just steps from campus. “At around 7:10 p.m. Lowell Police learned of a stabbing victim behind LeLacheur Park… The victim has no ties to the university and investigators do not believe this was a random act,” the email reported. Despite early reports that the act was likely drug-related and entirely unrelated to any UMass Lowell student or event, nervous mutterings began to spring up in the campus-wide conversation. With the suspect, “a Latino male of unknown age with a full beard” still at large and “last seen walking toward Hall Street wearing all black and… possibly wearing glasses,” an air of uncertainty and discomfort arose among students at UMass Lowell for a short time. Luckily, the suspect was soon apprehended, providing a sigh of relief from a tense campus and the Greater Lowell community. The relief and comfort, however, was momentary. Reporting took a more negative turn when the unidentified victim, hospitalized at Lowell General in critical condition was pronounced dead. The Boston Herald reported that, overnight, the stabbing investigation had become the first recorded murder of 2019 in the city Lowell. In the days that followed, details of the grisly event became more difficult to digest. The victim, Asiatic “Ace” Alvarez, was not yet 20-years-old and had lost his life over a minuscule amount of marijuana. “Prosecutors say 18-year-old Asiatic Alvarez — a Lowell man and father of an infant son — was stabbed to death on Monday night over less than $100 worth of marijuana,” reported the Lowell Sun. The Lowell Sun reported that the drug deal gone bad had resulted in Alvarez suffering a punctured heart, lung, small intestine and stomach and was witnessed by an unnamed juvenile. Alvarez’s attacker was arraigned Tuesday in Lowell District Court. “Victor Crespo of Lowell was arrested and charged with second-degree murder and two counts of violating a restraining order, according to the Middlesex District Attorney’s Office,” reported MassLive.com last Tuesday. 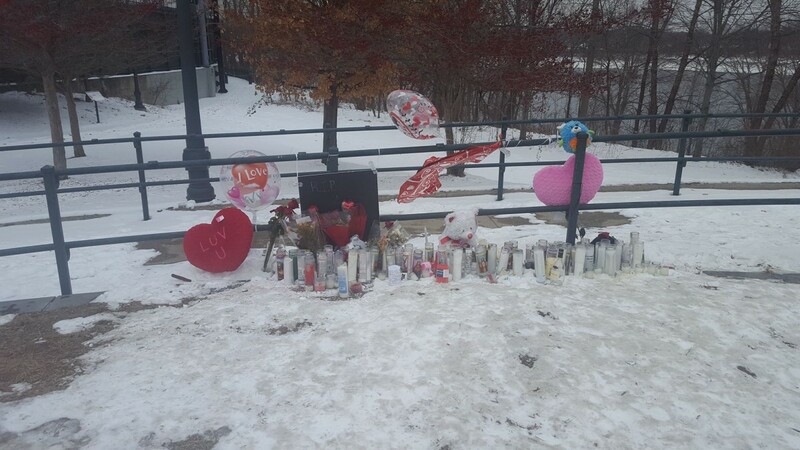 Alvarez’s family and close friend to mourn passing and memorialize the life of the young Lowell father Tuesday night with candles, the release of balloons and several statements by family members. One such family member was Alvarez’s father, Hector Alvarez, who told the small gathering, “That was my son that just died. I have to bury my son. Do you hear me? We got to stick together. We all got to stick together. We all got one life and my son’s life is gone,” according to the Lowell Sun. The memorial still sits on ice behind LeLacheur adjacent the River Walk, a sobering reminder of Alvarez’s senseless passing – and, unfortunately, a sight that is likely to keep UMass Lowell students on edge for some time as they move about campus after dark. A number of discussions are already taking place within the Office of Residence Life, UMass Lowell administration and UMLPD about how best to mitigate student fears – and continue making the campus community safer – following this horrible occurrence. The UMass Lowell Connector will report on those discussions in the weeks to come. As an Alumni, I recommend the university allow students who are properly licensed to carry firearms on campus pending a sit down with Campus Police and a waiver clearing the school of any liability should the student use their firearm.